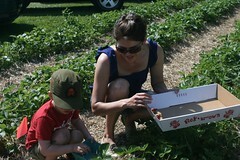 Over Memorial Day weekend we went strawberry picking. I had wanted to do it last year, but I got to the farm too late for strawberries (I guess having a 1 week old cramped my style last year 🙂 ), so last year we picked blueberries instead. Madeline (“Nanny”) was staying with us so she came along, and Grandma and Grandpa came, too. I thought Hayden would enjoy picking the berries, but I was wrong. There was a lot of whining and talk about wanting to “go back in my van.” Even the promise of ice cream when we were done picking didn’t really intice him. Apparently he was interested long enough for us to capture one picture of him. 🙂 We got just under 10 lbs of berries, and I made 2 batches of freezer jam (which equates to… lots of jars in my freezer). There were still tons of berries after I made jam. I had them in tupperware to last as long as possible, which really did keep them good for a long time. I was bound and determined to eat every last one of the berries, and eventually we did. Thank goodness the kids are fruit junkies! And afterwards, we did all enjoy some ice cream. Hayden was funny because as he and I were standing in line for ice cream, everyone else was outside. I realized I didn’t have any money, so I asked Hayden to go outside and tell Daddy we need money. He ran outside up to John and excitedly said, “We need money, Daddy!” I don’t think it translates as cute in writing, but you’ll have to trust me that was (so I hear, again, I was inside). It was also funny because it was sort of a test. It’s relatively new that you can tell him to tell someone something and he will do it at all or convey the right message, and it’s not 100%. There was an equally good chance that he would have gotten distracted along the way and never made it to John at all, or not remembered what he was supposed to tell him.